Without a waste treatment plant, tens of thousands of tons of garbage have piled up in Con Dao Island off the southern province of Ba Ria-Vung Tau comprising household waste and rubbish washed from the sea. 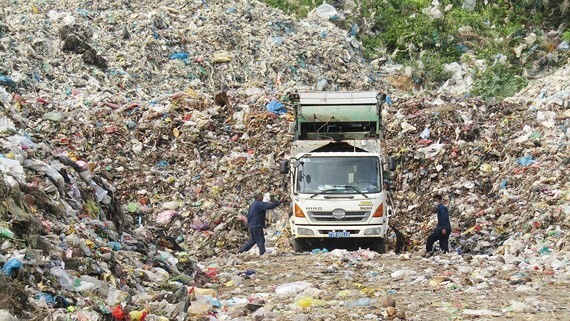 According to the People’s Committee in Con Dao island district, about 72,000 tons of garbage have been transported to Bai Nhat dumping site over the area of 3,800 square meters for the last 20 years without proper treatment. The dumping site is covered with stinky odor with garbage piling up to tens of meters in height. Mr. Nguyen Van Long, a worker at the site, said that the area receives from 6-7 trucks of garbage but the incinerator there is too small able to handle two of them a day. Room left to dump garbage in the site is over 200 square meters now while the volume of garbage discharge has been increasing day by day. Sludge leaking from the dumping site has polluted nearby beaches. Adding to the woe, trash including plastic bottles, nylon bags and Styrofoam boxes has been washed ashore in Vong Beach and Dam Tre bay. Leaders of Con Dao district said that sometimes washed garbage reaches five tons a day at Vong Beach. Most of beaches in the island have faced the same situation. That is consequence of no regulations on treatment of waste from boats at sea. Statistics from the district show that household waste increases by 5-10 percent a year. The district now collects garbage from 1,840 households, 32 public service units and 50 businesses with the total amount of 15 tons a day. Of these, the district is able to handle five tons, the remaining amount moves to Bai Nhat dumping site. Moreover, Con Dao receives about 2,500 visitors a day contributing in increasing the garbage volume there. According to the district’s calculation, a visitor delivers about 2.5 kilogram of garbage a day. That is also the back of opening traffic routes to Con Dao too fast without investing in garbage treatment system appropriately. In September 2018, the People’s Committee of Ba Ria-Vung Tau province organized a press conference on waste treatment a Bai Nhat dumping site. 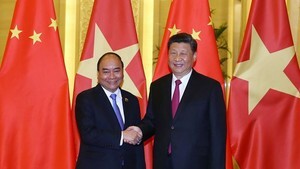 A company proposed to build a treatment plant with the capacity of 115 tons a day and the total capital of VND36 billion. However in February this year, the district People’s Committee suggested transporting all the garbage to the mainland by boats for treatment with the total cost of VND35 billion (US$1.51 million). Specifically, garbage will be pressed into cakes and transported to the province’s Toc Tien Centralized Waste Treatment Area in Phu My town. To handle garbage washed ashore from the sea, leaders of Con Dao district People’s Committee said that there should have regulations banning boats from littering at sea and propaganda to raise residents’ awareness against littering in beaches. Mr. Dang Son Hai, deputy director of Ba Ria-Vung Tau province Department of Natural Resources and Environment, said that if a waste treatment plant is built at Bai Nhat dumping site with the capacity of about 100 tons of garbage a day, it will handle all of the amount of waste in the island within two years. Transporting garbage to the mainland will take three to five months.